This article is an edited version of the podcast held between Andy Coolidge, Managing Partner of Alabama-based sweeping contractor, CAM South, and Ranger Kidwell-Ross, Editor of Worldsweeper.com and the Executive Director of the World Sweeping Association. The unabridged audio podcast is also linked at the article’s end. Andy Coolidge brought with him to his current position 20 years of operations management experience with properties, including parking lots. CAM South is also a full service provider of exterior services. That makes this is a rare opportunity for our contractor readers (and listeners of the linked podcast) to hear why Andy and CAM South have been so successful. For one, he and his management team know what the customer needs; they know how their expanded services provide the quality that’s needed; and, they provide the professional wisdom that’s needed to maximize the benefits to the CAM South customer base. 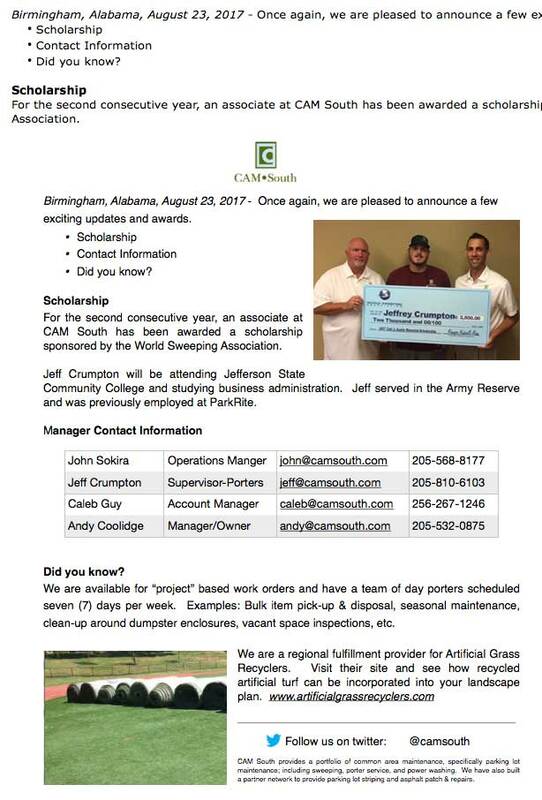 The proof is in the result: CAMSouth has expanded significantly since the company was purchased in 2014, from ownership of one-and-a-half sweepers (I’ll let Andy tell you why, where that “half” came in), to having 30 personnel working every day. The company is located in Birmingham, Alabama, with another office in the Auburn (Opalika) area. With that as introduction, here is a somewhat edited version of the podcast interview I held with Andy in August of 2017. WSA: Andy, welcome to our interview and I thank you very much for joining us. AC: Thank you! Thank you for inviting me, and putting this together. WSA: Via our previous conversations I know CAM South was actually started 10 years ago by some one else. However, the real growth has occurred since you acquired the company in May of 2014. Tell our readers a little bit about your background and then, how on earth you could have started with “one and a half sweepers”? AC: Well, Ranger, let’s go with the easy one — the “one and a half sweepers.” What I acquired was two cabover sweepers. One was a Victory, one was a Schwarze. As for the “half:” One of the machines never ran when I bought it. I knew what I was buying, although I guess I was told I was buying a sweeper truck that could be made to work. However, the chassis engine didn’t run. So, I had to swap out a chassis engine in that sweeper. That didn’t scare me too bad because, like I said, I knew what I was getting into (with the engine), but no story goes that easy. I also spent some extra money and had a good deal of trial and tribulation swapping some wire harnesses… then more wire harnesses. At that point, I finally had a rolling chassis but the actual sweeper didn’t work yet. We then took it up to our friends at Schwarze to give it a look-over. That’s when I learned it was going to be another expensive endeavor to refurbish the sweeper portion. Ultimately, I ended up trading that machine to Schwarze and buying one of their Updraft models. So, we started off with one-and-a-half, but ended up with one really good brand-new sweeper and one “so-so” — but at least operating — cabover. Today we operate four sweepers as well as five pickup trucks our support team uses for day-porter service, towing trailers and all that good stuff. WSA: You’ve been in the parking lot management industry for about 20 years, both for a national provider and as a private operator. You must have felt that gave you the kind of experience and background that you needed to excel on the other side of the street, so to speak, since you knew how to provide the service property managers would need. 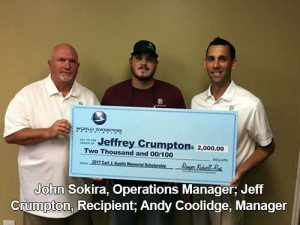 AC: My two positions in that industry were both operations-based, managing front line employees and keeping customers happy. I’ve been a Project Manager, an Operations Manager, a Vice-President. In each position I was dealing with front line employees and the operations that go with that. Although I contracted with parking lot sweeping companies I never fully understood what they did. Keeping our parking lots and outside area swept was just one component of the parking lot management. I did know that they came at night, they blew debris with blowers, they ran sweeper trucks around. One of the biggest liabilities of my acquiring the business was the mechanical part — having a fleet of vehicles. Up until three years ago, I knew you put gas in it, you took it to somebody to change the oil every so often and you turned the key. In the last three years I’ve really gotten versed with vehicle mechanical issues. Not major service, but more than just changing the oil and putting the fuel in, for sure! WSA: You have to know a certain amount just so you can oversee that kind of thing. Do you feel that your prior experience gives you a leg up when you go out and talk to property managers and, if so, what do you know that other people may not? AC: I think it is a leg up, mostly because I was out there being exposed to that side of things. Property managers are pulled in thousands of different directions, right? They love sending emails (instead of meeting in-person). They’re pulled by tenants; they’re pulled by their bosses or their superiors; they’re pulled by contractors in every which direction. Everything is an emergency that has to be done right now. Understanding where they’re coming from was very helpful when I was changing my hats. As the parking lot manager, I’m wearing a property manager’s hat. When something comes up, you want it dealt with — immediately and, more importantly, consistently, which is something I share with our clients and that I share with our employees. Contractors need to know the absolute importance of consistency. We all change trash bags every night and anybody can change a trash bag. We can maybe do it a little bit faster than the “common Joe on the street,” because we do it every night. But, do I change a bag better than the next guy? Maybe, maybe not. However, one of our real advantages is that we do it consistently. We do it day in, day out, every night. And we do it at night at the times when people want to be home in bed. In other words, it’s up to you to go out and handle 4 sweeper trucks and 25-30 employees with commitment and, above all, consistency. I’ve found that doing so also takes a good team of people. As a contractor, we need to demonstrate a consistent kind of responsiveness because property managers are pulled in so many directions. Our job is to take one little thing off their plate. When they hire CAM South they don’t ever have to worry about their parking lot being swept or worry about changing trash bags. We allow them to worry about something else instead of any of the stuff they’ve hired us to do. WSA: A comment you made was that you feel like, in sweeping, “no news is good news.” Which means that if you’re doing the job right, it’s going to be invisible. If it’s done correctly you won’t hear from your customers about anything. That also means that when they do contact you then it’s a big deal. I really appreciate how you characterize getting right onto any concern and immediately getting it handled correctly. That sounds like a very professional way to run your business. AC: Thank you! In this business, we do maintenance; we’re cleaning stuff up. Nobody calls us to say how great things look. Rather, they call us to say something got missed, something’s overflowing, there’s a problem somewhere. And, those things happen. You want to be immediately proactive and go out and deal with it quickly, professionally. Still, you’ve got to be able to balance the expectation and the needed response time. WSA: There has been a certain amount of retail closure that’s been happening with brick-and mortar because of the increased competition from online retail. Have you seen that to be a problem with reduced budgets, bankruptcies or store closings? Do you feel like diversification into other areas is called for as a result of that? AC: That was a nice quick summary. We can go on for hours and hours about the impact of reduced brick-and-mortar. In our area we’ve seen some of the national retail stores close. Recently, we bid to retain a pretty nice sized traditional mall; we did not retain it but that was the result of a price decision only. Then, about 45 days ago, it was announced that one of the two major anchor tenants at that site was closing up and leaving. Although the property was no longer in our portfolio, what does that mean for the company that picked it up? I’m sure the mall will cut back sweeping nights per week and do who knows what else to reduce their costs in other ways. It’s happening everywhere we go. Price has become a pretty big competitive factor, along with service or response time. We’re always looking at how we can improve our response time and also looking at diversifying wherever it makes sense. For example, we bought a bucket truck awhile back. Now we can change light bulbs and do some other types of related services in-house. We just recently started, via a contract with the State of Alabama, to pick up roadside litter in front of and behind the mowers that do the medians and the shoulders on the roads. WSA: The roadside litter removal is an inventive diversification! AC: Yet it fits into our central portfolio of litter pickup. What we do all is within that arena. WSA: You are really moving toward the one-call model. I feel sure that one of the reasons for that is your ability to recognize the best way to run your contracting business from your previous perspective of being on the property management side of things. Those folks are busy and pulled in a variety of ways. Contractors need to understand that property managers love to have the ability to do as much as possible with one contractor. AC: That is absolutely correct. The question becomes ‘what services do we want to self-perform?’ In addition to branching into whatever areas make sense, we have developed a very nice contractor network. We partner with another contractor that’s great with parking lot striping, sealcoating and infrared asphalt repair. I’m not getting into the roofing business but we know some capable roofers. We’re not electricians, but have electricians that we can contact. Our being that ‘one call’ makes it easy on our customers. We’re not going to get rich or be able to retire off of that kind of subcontracting work but it engrains us a little bit deeper. Our customers have learned that when they have a challenge, an issue that needs taken care of, they can likely solve it with a single phone call to CAM South. We either self-perform the work or pass it around our partner network. WSA: It’s clear that you are really working to advance a reputation of professionalism at all levels. How do you transfer that to your employees; via training, meetings, keeping their morale up? AC: The majority of our folks have other jobs: full-time day jobs or other part-time jobs. Most of our employees are guys that have kids in college or are getting ready to retire but need some extra pocket money. I have a couple of full-time guys that are committed to what we’re doing, but we’ve got a great overall culture. Our team members are guys that look out for each other and help each other out. All of our guys are in uniforms, all of our guys are “W-2” employees, are enrolled in Workers Compensation. We utilize a payroll service provider with direct-deposit. We put on company-sponsored events, just to build that culture. I take our employees to “company night” at the Birmingham Barons baseball team out at Regions Field, our brand-new ballpark they built in downtown Birmingham. We buy everybody dinner. They bring their families and we have a nice night together that’s not at work. We have ping pong tournaments at the shop, again, just some fun stuff. I think that makes us more of a team. I do know that all of our guys are professional and they understand what it means to be consistent. Nobody is afraid to change a trash bag. That’s something we all do. Our people keep their work commitments. When they say they’re going to show up and take a schedule, they do. That makes a big difference since it’s hard when guys call in ‘sick’ at 9:30 or 10 o’clock at night. As your contractor readers know, there are no extra guys just sitting around waiting to fill in. We do have a pretty thorough interview process. We do pre-screening, a pre-employment drug screen and a background check. Next a prospective hire goes out and shadows somebody. They ride in the passenger seat with an experienced employee on a day run. I want to make sure they understand what they’re getting into. A couple of different current employees interview them and provide job training, probationary period-type stuff, before they are turned loose on their own. We spend time on the front end, so when we make that decision and make a job offer it’s typically to somebody that is going to stick around to learn our culture, learn about the types of folks they’re going to be working with, they learn about the company and what we provide. All that just goes to building a good team, keeping a good team. It’s hard to find good people so after we find them and invest resources into them we want them to stay. We focus a great deal of effort on that. WSA: I think a lot of contractors don’t realize how expensive it is to retrain a new employee. They don’t really track all of that. Especially when you have somebody that fits in with your culture and otherwise handles their job well you don’t want to lose them. Clearly you’ve developed not only a business, but a culture — a camaraderie — among your people. AC: Yeah, one bad apple can ruin it all, right?! The team is not going to let someone come in that doesn’t carry their weight. We do all this pre-employment. We had an initiative this year to do monthly training sessions of personal and professional development. We started out mandatory for January and February, which was covering the basics of an employee meeting, safe driving, where to clock in/clock out — the housekeeping types of stuff. After that we made them voluntary personal professional development sessions. Although we want to be well trained. We keeping the uniforms looking sharp, how do we take care of our trucks, doing our predeployment inspection — even about how to handle personal finances. Some of this stuff they can take with them wherever they go. I want our employees to be professional. An example I use is Chick Filet, the fast food restaurant chain. They’re big here in the South and their culture is “Happy to serve you.” and “My pleasure.” Southwest Airlines has also developed a great culture. You know, we’re not going to compare ourselves to those big, national, worldwide companies, but it’s the same stuff on a really small scale, with 30 guys! To make ourselves different, better, we can focus on culture and we can hand-select who becomes part of our team. Our front line guys are the bread and butter, the ‘face’ of our company that are on the job every night. They take care of the trucks and they take care of the customers, so we’ve got to make sure we have a good team out there doing that. WSA: Using an example from retail: They’re seeing enormous pressure from online. It’s ever more important that, when you walk into a store, an employee that sees you needs to give you a smile and say “Hello” and “How can I help you?” or something like that. Teaching that to retail employees is important, because once people learn it, they think: “Well, that makes perfect sense!” — and they’ll do it. But some of the things that are commonsense certainly aren’t common to all and you do have to teach it. One of the things in our previous conversation that I thought was interesting is that you don’t put a time constraint on a particular account or a maximum amount of time you can spend on a site before your employee has to be out of there. That makes sense since you never know the state of a client’s lot at a given time. But you must use, then, GPS tracking to make sure that your average amount of time that you’re spending on sites is in the same budget that you’re charging them for. Talk about that a little bit, if you would. AC: Yes, all of the trucks have GPS trackers. We tell our employees that we want the parking lot clean when they leave whatever time that requires. But on the back end, the next morning starts with one of our operations managers reviewing the previous night’s routes. We go through and check the employee start time and start time of the vehicle, and see that it matches with when they clocked in. Then we follow the schedule to make sure that every property was serviced as it was supposed to be. After that, we drill it down even further. What’s the time arriving onsite, what’s the time leaving. We do have a benchmark for each of our clients. If property “A” takes 30 minutes but that truck was only on the property for 10 minutes, something happened. Either they just drove right through it or the property was exceptionally clean and didn’t require the time. Either way, that’s a “flag.” Typically we then send somebody by to do an in-person inspection today while they’re out and we put it on the shift report. The info goes back on the board for the guys the next night to check and there’s usually a reason. On the other side of it sometimes we find someone spending too long on a given property. We also want to know why would they spend an hour-and-a-half on a property that’s supposed to take 30 minutes? Perhaps they got a flat tire and they had to change that. Or there was a traveling carnival that came through and the whole parking lot was barricaded off, or the carnival just left and they had to clean it all up. GPS is just a tool that helps us provide benchmarks. In those situations we might do a little counseling but not going to go out and put time constraints, and say: “You HAVE to be there no more than 30 minutes!” That’s why it’s so important to have good personnel who can make decisions, think on their own, and ideally, you know, back up whatever happened. WSA: Do you also GPS monitor your trucks for maintenance or other issues? What kinds of other factors do you check with GPS? AC: Oil changes are a good example. We use GPS to keep a running tab on mileage. We have little ticklers built in, you know, 200 miles to the next oil change. The system sends emails out to the operations team. Via GPS we also know when the truck’s engines are on and it does speeding alerts. We can set parameters of so many miles per hour over a speed limit creates a marker. Then, if the same thing occurs for more than 2, 3 or 5 cycles, it can send an alarm. We cross-reference the GPS to the timekeeping, when all the employees clock in and clock out, which they do with their mobile devices. It has a dashboard that we can look at and we pool all these tools together and come up with a simple dashboard for the previous night’s operation. We have developed key performance indicators with benchmarks as one of the metrics. Then, the question is what to do with all of the information. WSA: Well, that’s right! And you are talking about the importance of going through that, having somebody go through that every morning and be ready to talk to your employee that night, if there are discrepancies. That needs to be done on the next shift because they’re certainly not going to remember three days from now, five days from now. AC: That’s right. And when it’s info we’ve asked them to provide us with; for example, anything that has to do with pretrip inspections we mark down every night. When someone marks down “the tires are looking a little worn” and we don’t respond, then they’ll wonder why are they doing it. We make sure to provide feedback: “OK, thank you, we checked it, we’ll rotate the tires tomorrow,” or the “scheduled services in 1000 miles.” If you want your people to report information then they need to know what you are doing with the information. When we look at pretrip inspections we do something with that information. That’s the only way for our employees to know that this is valuable. They see the stickers go on the windows; that the oil lights have been reset; they see the tires get rotated, so they know their concern is no longer an issue. WSA: All of those things really speak to professionalism and cohesiveness, but also to safety. You want your employees to know that you are working to keep them safe and that also goes out to the property managers. When they see a professional team on their property and when they see a professional job is getting done and when they don’t have to pick up their phone because of recurring problems, that’s huge. Most everyone realizes that somebody can make a mistake and things can happen, and if that happens once in a while, well, no problem. But when it happens all the time, to where it gets on your consciousness, especially if a property manager has to wonder what’s going on at his parking lot at night, or whether a good job is being done, you know, that’s certainly what you don’t want. Keeping customers is a lot easier and less expensive than going out and getting new ones. On that topic, what do you do to gain customers and how do you sell them on using CAM South? My guess is that you are not the cheapest in your marketplace and probably are not going after low bid business. So, if you’re not going in and saying, “Whatever you’re paying now, we can do a cheaper job just as well,” what do you tell them? When you have some businesses that are within an existing route that you’d like to pick up, how do you approach those potential customers to get them to consider moving to CAM South? AC: Where we’re at now, three years into it, it’s become challenging. We now know pretty much all of the real estate groups’ property managers and we know all of the locations in our market area. We just want to be in front of them. If they do have a question, if they do have a concern about a current provider, when budget season comes up, if they’d like a contractor to just go look at something: We want to be on their minds. Going back to property managers having a lot of things going in many different directions; if they get out of their car this morning and look across their parking lot and are not happy, that dirty lot will be on their mind right now. Chances are, they’re going to want to make a change right now and I want to make sure I’m one of the calls they make. We do a variety of contacts: Cold calling can work, as can introduction emails that are branded, short, simple, and to the point. This is who we are, this is what we do, here’s my contact information, please keep us in mind when you have a concern, when budget comes up, when your contract renews, etc. If your information is professional, chances are it gets dropped into a folder so that when that day comes, they remember us. The best way to get new clients is via satisfied existing customers providing referrals. All of the real estate associations, BOMA, IREM; all of the property managers speak to each other. It’s a small world. So, a referral by one of them to their associate is more important than anything that I can do. AC: So keeping the existing customers happy to where they tell their peers that CAM South does x, y and z for me.” or “We haven’t had any issues on that topic with CAM South.” We’re out at night and nobody sees us, but when they do call we show up. We’re professional, we’re wearing uniforms, we have a CAM South email, we have a website, we belong to memberships like World Sweeping Association. In my experience, before they hire a new contractor people go searching for stuff like that. When they do they’ll discover that we’re there; we’re part of what’s going on. WSA: I agree that sort of thing brings you credibility. I’ll comment on some things that I’ve heard from other contractors that we can just add into here. These are ideas for you as well as for them. For example, at World Sweeping Association we have a requirement that new members sign our Ethics in Power Sweeping initiative. As you know, since as a member you have signed it, you have asserted in writing that you are following basic good business practices. You’re paying into workman’s comp., you have insurance, you do no midnight dumping, and so forth. Because of that, one of the forms that we have on the WSA web site is an explanatory about WSA’s ethics requirement. You can leave a property manager with a handout that says: “Here is what we do as a member of WSA. You might ask your current contractor if he would be willing to sign something like this.” What it does is put a seed of doubt about the professionalism of the other contractor. I first started the Ethics in Power Sweeping Initiative for the Contractor Locator at WorldSweeper.com. To my surprise, I lost about half a dozen of the 40 or 50 businesses that were currently in the Contractor Locator. They didn’t want to sign on to it. That told me the idea was an important one because clearly there are contractors out there that aren’t running professional businesses. Although sorry to lose the business, I also did not want to be promoting unethical firms. Here are a couple other ideas I’ve seen gain business for contractors: One is, if you’re sending them an invoice every month to include a special from one of your other projects. Perhaps you’re reminding them that they need to schedule their spring power washing. Or, maybe you want to promote something that is kind of slow in the upcoming season that you’re trying to jump start. The other is to make sure that your customers have a list of all the services that you provide. Get that list in front of them. One of our WSA Advisory Board members gave out magnets with their logo and contact information on them along with “Here are all the services we provide.” The magnet sheet was small enough to fit onto most any metallic surface. Something else from WorldSweeper.com that can help you stand out is to use our postcard section where you can send old sweeper postcards via email. When you’re emailing someone a thank you or other note, consider going to www.WorldSweeper.com/pd where you can include a vintage sweeper from the 20’s, 30’s or 40’s. You might send one of those photos along with a message that says: “Thanks very much for seeing me today! You’ll be glad to know that our sweepers are even newer than this one! — Ha-ha-ha!” You’ll find that it will stand out to the property manager because you did something a little bit different, something that’s memorable. In many parts of the U.S. contractors are dumping exclusively into onsite client dumpsters. They also work to tout the environmentalism of sweeping. What’s happening in Alabama in that regard? AC: Dumping is pretty informal down here. We have a 20-yard rollup at the shop. At the end of every route our sweepers dump into it. We also have some 8-yard containers strategically located around Metro Birmingham for longer routes or higher volume properties. Either way, we want our trucks parked after their shift with a full tank of gas and an empty hopper. You referred to the midnight dumping; I think we’ve been hit with that. An overflowing dumpster on one of our properties, where my guys claimed it wasn’t us because we didn’t dump at that property. However, so as not to get a black eye we had to clean it up and pay for an extra dump on somebody’s dumpster. But I think from a legal, from an environmental standpoint, I think Alabama is pretty informal, you know. “Pick up the trash and make it disappear!” And I think everybody uses onsite dumpsters where provided or has their own, but I don’t know of any rules or regulations related to that issue. WSA: I suggest that looking into the idea of screening is something that you would want to consider as you get larger. It largely depends on what your dump fees are, but when you pay for emptying your 20-yard dumpster keep in mind that by screening your debris you can lose up to 70% of the weight of the material going to a landfill. AC: We haven’t looked at screening debris, but we did look at getting our own bulk fuel, via around a 1000-gallon tank. However, gas prices over the last while have been very favorable. We thought about taking some of that savings and getting our own onsite filling station, but the math just doesn’t work right now. When we acquired the business I was told, “Just buy the cheapest fuel on the front end. Don’t worry about rebate programs, don’t worry about discount programs.” We are running all over Birmingham Metro 7 nights a week so we find the cheapest gas we can get and just buy it, cheap. WSA: Do you use a gas app for that? AC: Each sweeper now has a fuel card. It’s one of the benefits we get by belonging to the World Sweeping Association. Every vehicle has a signed card and we can put constraints about how many purchases per night or a dollar amount, you know, up to $100 maximum. The cards can have pin numbers and they can have odometer requirements if you want. It just depends what you do with the information when you get it. Our sweepers are primarily gas except for our one Schwarze Gale Force, which has a diesel auxiliary engine. There’s no question it’s been worth it having that Gale Force in our fleet, though. It has allowed us to do some bigger jobs. I’ve got videos of it sucking up three-inch roofing stone! One of the retail plazas did a roofing job and the contractor left a bunch of two and three inch stones. We had to shovel the piles, but when we got down to one layer on the ground, we got that Gale Force up and it sounded like a hurricane coming through. It’s a great truck to have in the fleet, ’cause we can say “yes” to some jobs that the smaller trucks wouldn’t be able to accomplish. WSA: Right! Well, and it’s important to have that diversification in your fleet, too. AC: Yeah… The smaller Schwarze Updrafts are great on parking decks; nice fuel mileage on those. Hey, one more plug for you and all the benefits you’ve coordinated at your World Sweeping Association and all the benefits that you’ve coordinated… Marathon Hydraulics, we’ve bought several things from them. I’ve gone to the WSA website a number of times and used the network that you’ve developed for discounts, for parts, for availability. WSA: Well, I’ll push that plug right back at you, because you have been willing to be involved with our organization and providing information anytime that it was needed. You have reviewed new articles and that kind of thing. You have also contributed to fund WSA’s Scholarship Program. Your involvement, too, is something that’s been very admirable! AC: You know, it expands our company culture. Our front line employees, what we’re trying to do with our guys and what we’re trying to build as a team. I’m not going to change the power sweeping industry by myself and I have no intent to, but it’s nice to know there are guys like you out there and some of the other folks you’ve introduced me to, all running professional operations, professional equipment, professional teams. It’s just a nice group to be associated with. WSA: That’s for sure! In an article I recently wrote for Pavement Magazine, I keyed in on that Martin Luther King Jr. quote that’s so famous. It’s intent is that if a man is going to do something, do it right.” I used the article to remind the sweeping industry that they are the first line of defense for water quality. That’s the reason I got into this educational enterprise about 30 years ago, to teach public works directors that they were not picking up horse poop off the streets anymore, they were picking up clutch plates and brake linings, and other kinds of nasty substances that, if they are allowed to run off the road, degrade water quality. As we’ve heard so many times, “Water is the new oil.” It’s becoming more and more scarce, more and more difficult to keep clean. And power sweeping is the best way to keep that material from running into waterways. So you can definitely hold your head up high in this business, that’s for certain! AC: I agree. I’ve gotten phone calls from a few freight companies, freight yards, for those exact reasons. They have a yard full of tractor-trailer trailers and they needed to show that they are doing what it takes to maintain water quality. You know, we’re just one piece of their plan, but an important one. I agree, I see it first hand. WSA: Well, is there anything else? Is that our end, or… How would you like to wrap this up? 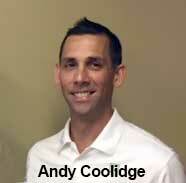 Andy Coolidge is the Managing Partner for Cam South, an LLC that is located in Birmingham, Alabama, with another office in the Auburn (Opalika) area. You may reach Andy via email sent to andy@camsouth.com.